What better thing to do on a snowy day than brew some beer? I found a recipe for a “Brute” IPA that looked interesting; I’m not sure if it is called “Brute” because of the large amount of grain (17 lbs) which translates to high alcohol content, or the large amount of hops (6 oz total over five separate hop additions), but I thought I would give it a try since I still had some lovely home-grown hops and I didn’t think that my last IPA was hoppy enough. I obtained the grains yesterday from a new brew store in Georgetown called Sound Homebrew Supply . It’s nice to have a brew shop fairly close to home, although they were out of the organic 2-row grain I wanted. I’m sure they’ll get their supply chain optimized over the next few weeks. As I started to brew, it started to snow. Brewing is a nice thing to do in cold weather, since mashing the grain and boiling the wort for an hour generates lots of heat that warms up the house nicely. 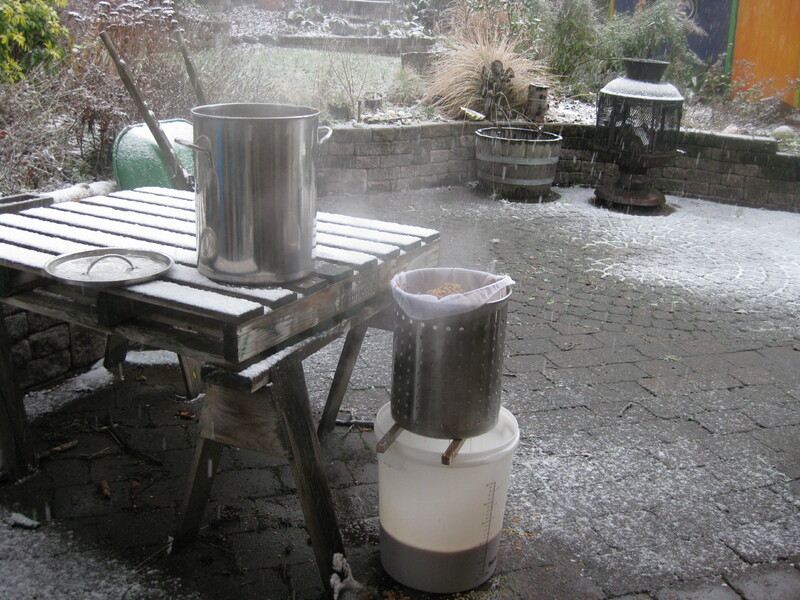 However, I do the sparging process outside because it tends to be messy. 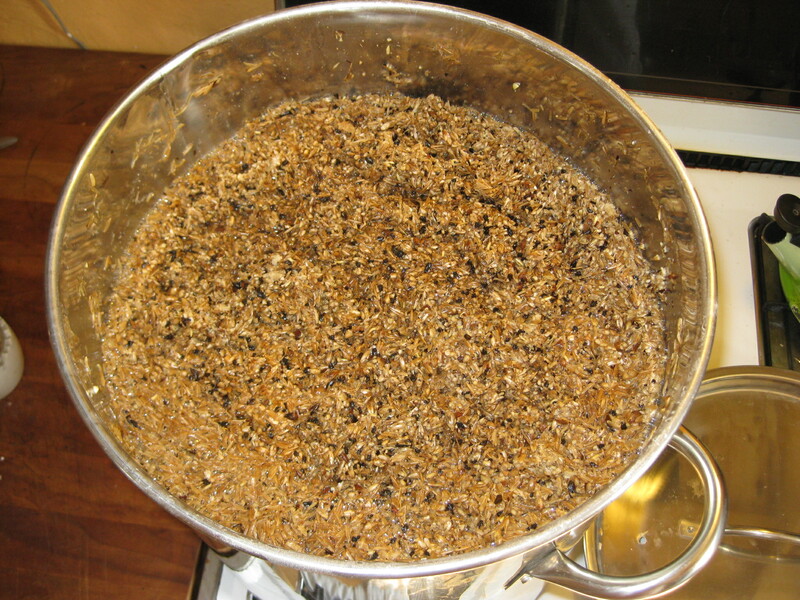 To sparge is to basically strain the liquid out of the mashed grains and then pour the hot water over the grains to get out all of the sugars. I sparge with a somewhat unique setup, using the large colander-like thing that came with my brew kettle (it was actually a lobster pot) and two pieces of wood to support it above the plastic bucket. See photo. After boiling for an hour with all of the hop additions, I have to set the wort out to cool to about 70 degrees before pitching the yeast. This was a cinch in the cold weather, I just set the kettle in our outdoor tub, filled it with a bit of cold water, and threw in some snow. When I returned from band practice later in the evening, it was the perfect temperature. I transferred the wort to the fermentation bucket and pitched the yeast. Now I wait while the yeast goes to work. On Friday I brewed a Double Chocolate Oatmeal Stout. I found a good looking recipe on http://beerrecipes.org and followed it almost exactly. The only modification I made was that my friend Julio had brought over two grocery bags full of fresh hops that he picked from his garden a few days ago, so I used those instead of the hop pellets called for in the recipe. Amie fetched the grains and other needed ingredients at a brew store near her office in Kirkland. I started the brew in the morning and by late afternoon the wort was cooling in the bathtub. Late evening, I transferred the wort to the fermenter and pitched the yeast into the wort, now at 85 degrees. I was worried that it might be a little too warm for the yeast, but by the next morning it was vigorously bubbling away! Meanwhile, chickens have been vigorously enjoying the spent grain. Should be ready to drink in about a month!